Wolf Pack is using Smore newsletters to spread the word online. Welcome, Ms. Cline's Charging Cheetahs! What is a Wolf Pack Run? The Wolf Pack Run is Mt. Washington Elementary PTA’s very first Not-a-Jog-a-Thon Fundraiser. On December 5th students will run, skip, hop, jump and groove to music around the school track while parents, friends and family members cheer them on to victory. The purpose of this fundraiser is to take us over the $100,000 finish line to raise the funds needed for Teacher’s Aides & instructional support for 2015-2016. As you may know, the district does not provide this much needed support for our students. If we want it, we have to pay for it. Earlier this year the PTA asked parents to dig deep and give to our $30K in 30 Days campaign. 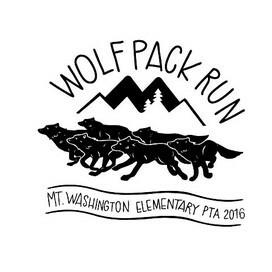 The Wolf Pack Run is a chance to engage our students in the process. Students are encouraged to ask for donations ($5, $20, whatever amount) from their family friends and neighbors to help support their education at MWE. Please note: we are not collecting “per lap” pledges, only “fixed amount” donations. 1) Visit our Room 9 team web page - Ms. Cline's Charging Cheetahs. 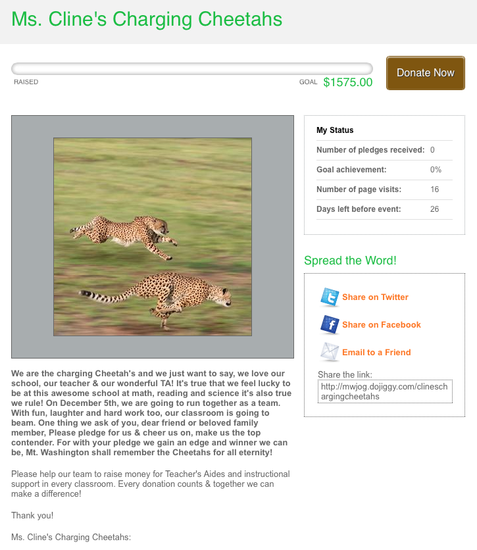 2) Click on the Twitter & / or Facebook icon & ask your friends to support the Charging Cheetahs. 3) If you or your child wishes to send an email to friends and family, copy our link ("Share the link") into your email & send a personalized message to family and friends requesting support for our team. 4) Visit neighbors, family friends or members of your community to ask for support in person. Here is a sample script/ letter to take with you. 5) Make phone calls to your loved ones who might appreciate the opportunity to support our class. What about folks who prefer to give cash or check donations? We have until December 5th to meet our goal and when we do, Room 9 will receive $100 to spend on a party of their choice. Let’s have fun as we collect support for our students and school.